Posh midfielder Jermaine Anderson during the game against Port Vale. Photo: Joe Dent/theposh.com. Peterborough United manager Grant McCann has backed midfielder Jermaine Anderson to come back from his second serious knee injury in 12 months as an even better player. The 20 year-old damaged knee ligaments during Saturday’s (September 10) 2-2 League One draw with Port Vale at the ABAX Stadium and is likely to miss the rest of the season. Leo Da Silva Lopes will be first in line to take Jermaine Anderson's first-team place. Photo: Joe Dent/theposh.com. Anderson suffered the same injury on his other knee last December and was out of action for eight months. McCann said: “If anyone can cope with a second bad injury in a year it’s Jermaine. He is one of the strongest players mentally in the squad. “I went to see him last night and gave him a copy of Paul Gascoigne’s book as he was someone who kept battling back from adversity. “I’m devestated for Jermaine. It’s incredibly unlucky for him and for the club as he was just getting back to his best after the first injury. Callum Chettle is a possible replacement for Jermaine Anderson in the Posh starting line-up. Photo: Joe Dent/theposh.com. “We had been nurturing him carefully by not playing him in every game. “We’ve now suffered three bad knee ligament injuries on our own pitch with Jermaine twice and Jack Baldwin, but we’ve checked the surface and we’ve checked everything else, including the players’ studs. It really does seem like we’ve just been very unlucky. McCann is likely to play 17 year-old midfielder Leo Da Silva Lopes in Anderson’s place at Sheffield United on Saturday (September 17), although he could also play Callum Chettle or Michael Bostwick in central midfield. 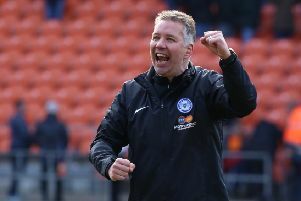 Posh can’t sign anyone from the Football League as a replacement as the rules governing emergency loans changed this season. Posh could sign a replacement from the National League and below.